The Dumbarton Bridge, which connects Menlo Park in southern San Mateo County with Fremont in the East Bay, remains the only bridge that allows bicyclists and pedestrians to cross the San Francisco Bay from east to west, with an eight-foot wide path on its southern side. From the bridge, the path continues for three miles along Bayfront Expressway (Highway 84) through Menlo Park to Marsh Road. It’s an important biking and walking connection for both commuting and recreation. Longitudinal cracks on the Bay Trail near Marsh Road. These cracks can easily catch the front wheel of a bicycle, causing over-the-handlebars crashes. Poor maintenance of the bridge path and Bay Trail by Caltrans, however, continue to discourage use. The bridge path is not swept often enough to keep it free of glass and other debris, which reduces the usable width of the path from the minimum eight feet required by Caltrans’ own Highway Design Manual. Occasionally, large objects such as car bumpers and plastic buckets litter the path. From mid-May to mid-June, large piles of highway debris blocked a two-foot section of the path. The culprit? After the roadway was cleaned, the garbage that had accumulated there was dumped onto the car-free path. Though the large items littering the path have been removed, glass shards and dirt remain. Left: Sunken utility access panels create a hazard and reduce the usable width of the Bay Trail in Menlo Park. Right: The same panel covered with a large steel plate. The Bay Trail west of the bridge presents its own hazards due to poor maintenance. Several utility access panels have sunken below the level of the path as the pavement has expanded slowly over time due to heat. One such panel now lies three inches lower than the path, resulting in an edge that can catch a bicycle’s front wheel and presents a tripping hazard for pedestrians. Caltrans’ solution for the past several years has been to simply place orange warning cones on the access panels. Uncut weeds narrow the path, eat away at the path's paved edges, and cause cracks to expand faster. Mike Jacoubowsky, who works at Chain Reaction Bicycles in Redwood City and describes the Dumbarton Bridge path and the intersections along Bayfront Expressway as “paved with glass,” believes the paths would attract a lot more use if properly maintained. So what will Caltrans do to make the path more usable? 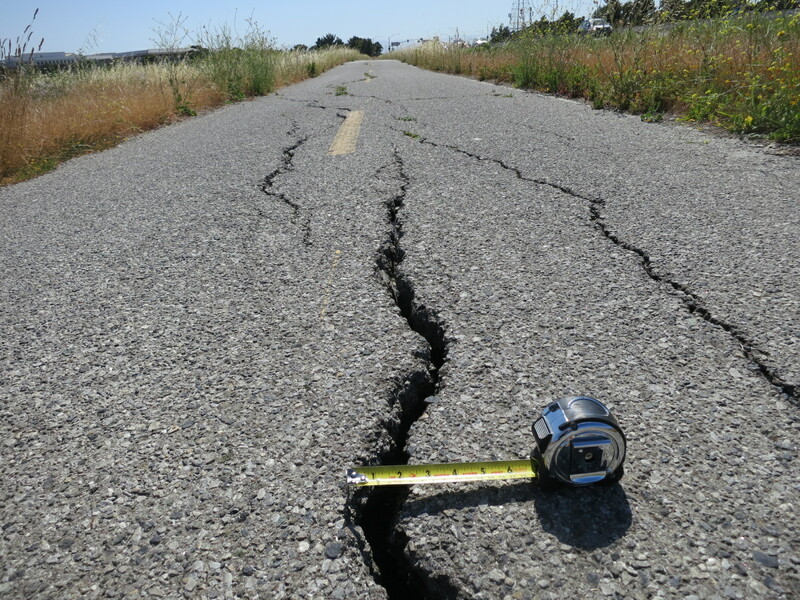 “The weeds are mowed three times per year, and the cracks will be repaired within a month and a half,” said Caltrans Public Information Officer Gidget Navarro. But the path on the Dumbarton Bridge isn’t swept because it “cannot accommodate the size and weight of the sweeper,” she added, and the utility access panel currently covered by the large steel plate is a PG&E project, not Caltrans. If BART goes on strike, expect to see hundreds of bikes using this route every day. I suggest they use heavy duty tires. Then buy one of those smaller-profile Green Machine sweepers SF uses on Mrkt St. Sorry, not a valid excuse CarTrans. Why not make the Bay Trail path wide enough to accommodate the sweepers they have, what’s wrong will allocating more space to foot and bicycle travel? Hrmm, if BART goes on strike you can expect to see fewer people riding BART to Fremont and bicycling over to Mountain View. But but but … Protected Segregated CycleTracks are the solution! Yes, a simple bike lane striped on the side of the freeway would be better. Totally. Mark, unlike (I can wager a couple hundred dollars) you, I have ridden that route more than a hundred times. And have the flats to show for it. I don’t think you’ll find much argument here about the crappy design of the Dumbarton Bridge bike path, but that’s hardly indicative of the utility of separated cycletracks in general. For comparison, the Carquinez and Benicia-Martinez bridges also have separated cycletracks and are much more pleasant to ride than the Dumbarton and are not filled with debris. The Antioch bridge, however, just has a rideable shoulder (still full of debris) and feels like a death trap. I live near the dumbarton bridge, and one of the first places i rode after starting to cycle more as an adult was the seperated bike path leading up to the bridge, the protected segregated cycle track on the bridge, and road on the other side towards the east bay. Here are the things that discourage me from riding the bridge more often: personal safety (scary man carrying groceries yelled obscenitites as I passed whom I now refer to as the troll under the bridge), the poor condition of the roadway on the other side mentioned in the article, no safe way up Marsh to the path unless I walk my bike there, and I am not entirely sure where to go after the bridge. It would be nice to have the service road on the east side repaved as part of the bridge improvements. 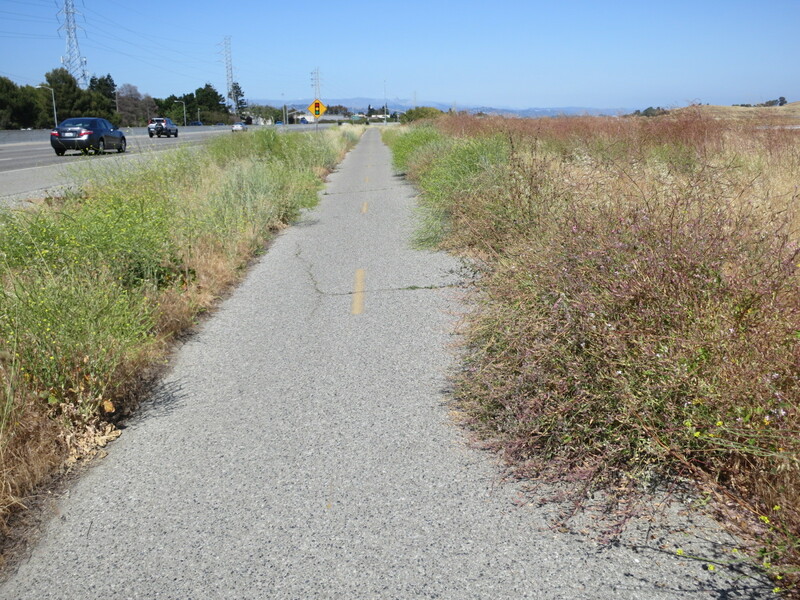 For the west side, i would like the bike path to connect with the paths that start near east palo alto and go through the baylands to shoreline. An article like this should include an interview with someone from Caltrans to discuss their side of the story- just interviewing bicyclists complaining about problems doesn’t provide the full picture. Does Caltrans think these are serious issues and take responsibility for them? Are they willing to commit to fixing them? How long would that take and what measures would it require? And if you reach out to Caltrans and they aren’t willing to comment or answer these kinds of questions, then simply tell us that. See their official response in the last paragraph. Go ahead, take your lane. I biked the Dumbarton yesterday (Aug. 5, 2013) and noticed a large bumper from a vehicle had been dumped onto the bike path. Have just submitted a service request to CalTrans…curious to see how long it will take to have it removed. Did it look like someone had moved it from a travel lane over the barrier and into the bike path? Or was it in the area where there’s no barrier? It was inside the protected bike/pedestrian path on the bridge itself, about 1/2 way along the span going toward the East Bay. Between the concrete traffic barrier and the don’t-fall-into-the-bay railings. Cut the lane size down to about 5 feet. Caltrans District 4 planners are hosting a final round of community workshops on proposed bicycle improvement priorities for state-owned roads in the Bay Area.